Art Saey was a courageous boxer. He was fast and packed a tremendous punch. In a two year period, he was undefeated for Coach Billy Regan in individual team competition and won most of his bouts via the knockout route. One time during his career, he won 17 consecutive boxing bouts by knockout. He won the 1947 national intercollegiate boxing crown. The following year, he was beaten in the final. 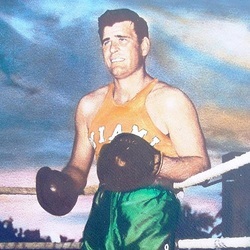 Saey won three letters in boxing at Miami and ruled supreme in the South for two of his three campaigns. Twice, he was named Athlete of the Year at Miami. He also lettered three seasons as a tackle on the football team.